Systems continue to evolve and expand in ways that benefit radiologists, providers, and patients. CT imaging in the emergency department (ED) is increasing rapidly. In fact, it now comprises more than 35% of all CT procedures in the United States. Today's CT scanners include technological developments that enable customers to better manage patient care, including lung cancer screening, dose guidance and regulation, spectral and multienergy imaging, and expansion of cardiac and brain imaging. These scanners and solutions also provide new levels of information to help clinicians make a more confident diagnosis at low dose, without increasing complexity in their routines. Scott Schubert, general manager of global premium CT for GE Healthcare, says that global CT trends continue to focus on addressing the increasing burden for diagnosing complex patients while ensuring optimal dose management, efficient system utilization, and standardization of protocol practice. "Health systems are seeking CT systems that can improve the efficiency of handling complex workflows and broad case mixes for settings like outpatient or emergency, from polytrauma to light headaches, or improving clinical excellence in specialties such as detecting small liver lesions or establishing lung screening practices," Schubert says. "Optimizing dose as well as greater standardization of protocols also continues as health systems improve operational efficiency and ensure patient satisfaction as well. Traditional installed CT systems are unable to address these dynamic challenges." Mikael Strindlund, senior vice president and general manager of Philips CT, says the CT market in the United States has shown consistent growth over the last three years, driven by a number of factors. "The conversion to a value-based payment health care system has changed what hospitals look for in return on investment, cost-effectiveness, efficiency, and increasing patient safety," he says. "Hospitals need to operate more efficiently and productively, meaning a shift toward more value-oriented products. Similarly, a quality shift has occurred with patients, who more proactively involved in their care." Trends from this shift to value-based care include data integration ("Big Data") and population health management. An influx of data combined with advancements in imaging helps leverage these data to not only bring further value but also apply it to broader populations. "While dose reduction remains in the spotlight, it's been joined by an emphasis on workflow and efficiency, and creating a better imaging experience for both patients and users," Strindlund says. "We are now seeing trends such as preventative screening—lung cancer in particular—making significant progress." Christine Ziemba-Landon, a product marketing manager at Siemens Healthcare, notes the big buzzwords for 2016 when it comes to CT are "dual energy" and "spectral imaging." "It's all about getting functional information out of the same CT without additional expense or radiation to the patient, while providing valuable functional information," she says. "Examples include detecting lesions earlier in the disease process and customizing future treatments." Structural heart imaging is also on the rise, a trend Ziemba-Landon believes will continue. The latest advancements in CT technology focus on the information derived from CT solutions, looking at how else this information can be used and integrated to bring further value. • the ability to integrate information across different diagnostic tools, creating opportunities to optimize information across the continuum of patient care. Schubert says GE Healthcare continues to converge the advanced capabilities across its portfolio of CT systems to further enable clinical excellence for the most challenging patients. "Spectral imaging technology in CT is bringing new clinical information to the diagnosis and characterization of many diseases," he says. "CT has historically been anatomical information only, in units of tissue density (HU). But [gemstone] spectral imaging, or GSI, brings additional contrast to the image that makes subtle disease more conspicuous, and brings chemical composition to the diagnosis to better characterize disease. This makes CT more definitive and cost effective, by reducing the need for downstream tests, especially in cancer, vascular disease, and kidney stones." Another trend that is likely to continue to gain prominence in 2016 is the transition of 3D printing from toy to tool. "All vendors will at some point incorporate the stereolithography (.stl) file format used in 3D-printed structures as a standard for CT and MR applications of the technology," Strindlund says. "While this is not in place yet across the board, we've seen advancements in this area trending." Tim Nicholson, senior manager, market development for the CT Business Unit for Toshiba America Medical Systems, says the biggest part of imaging today is the CT scanner. "What our customers are talking about is they need to show value—making care comfortable, safer, and new care pathways that improve the patient outcomes," he says. "What we brought to the table at RSNA is the Aquilion Lightning, a 16-row helical CT with the world's smallest detector element size of 0.5 mm for routine isotropic imaging." In November, Toshiba also introduced its FIRST system, which improves image quality with significant noise reduction while reducing radiation dose. It also cuts the time needed for model-based CT image reconstruction. Philips CT recently introduced the IQon Spectral CT, a comprehensive CT diagnostic spectral solution delivering valuable clinical insights such as improved tissue characterization and visualization for accurate disease management. According to Strindlund, Philips is "reinventing radiology" by introducing products that have a positive impact on the radiologist, the provider, and the patient. "Radiology has a unique ability to influence and improve outcomes, yet its full potential is often not realized. 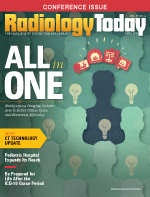 Because of its central role, radiology has the power to significantly impact the cost and quality of care through greater integration," he says. "It takes more than transformative technology to reinvent radiology. By integrating patients, practitioners, and process with technology, Philips helps radiology transform its care practice to impact outcomes." Siemens offers the SOMATOM Force, a Dual Source scanner, which uses two X-ray sources and two detectors at the same time. "It is capable of imaging not only pediatric patients but [also] adult patients in a second or less," Ziemba-Landon says. "That plays a key role in a couple of ways. The images are free of motion and we can save sedation and limit risks associated with sedation." Siemens' entire portfolio—from the 16-slice SOMATOM Scope up to the SOMATOM Force—are capable of dual-energy imaging, and are XR-29 compliant. In addition to the many equipment advancements, Schubert shares that GE Healthcare continues to introduce applications that further clinical excellence for CT imaging. "For example, Hepatic VCAR enables whole organ segmentation in less than a minute, compared to 10.5 minutes previously. This capability simplifies workflow, improves productivity, and reduces the time of the scan for patients," he says. "Another example is TAVI [transcatheter aortic valve implantation] analysis, which assists doctors treating very sick patients with an intuitive, noninvasive planning tool for interventional surgical teams." GE also offers a Gemstone Clarity detector for anatomical coverage in a single rotation to ASiR-V low-dose iterative reconstruction technology, which routinely reduces dose without compromising image quality. New legislation in the United States requires all CT scanners to adhere to XR-29 standards or face reduced reimbursements from the Centers for Medicare & Medicaid Services. As an extension to the Sustainable Growth Rate, this law includes the new MITA Smart-Dose standards of XR 29, which includes four new feature requirements that help CT users perform high-quality diagnostic imaging while supporting patient safety. These requirements are DICOM Structured Reporting, which enables recording of postexam dose information in a standardized electronic format; CT Dose Check, which incorporates two features—dose notifications and dose alerts—that warn operators and physicians when dose exceeds established thresholds; automatic exposure controls, which adjust the amount of radiation within prescribed bounds as needed to achieve the desired image quality; and pediatric and adult reference protocols, a set of preloaded parameters on a CT system that can be selected by the operator to complete a particular clinical task, such as capturing an image of the abdomen. In addition, there has been reimbursement approved for CT for lung cancer screening. Looking forward to the future of CT, radiologists should expect to see faster, more automated, and easier to use scanners. The technology will transition from a good interpretation tool to a machine with more quantification and a speedy and direct diagnosis. "There will be growing interest and demand for analytics solutions that can help medical imaging professionals deliver more value by reducing length of stay, improving compliance, increasing revenue, decreasing medical errors and medical legal risk, and evaluating outcomes and quality," Strindlund says. "CT will be able to routinely deliver anatomical information but also feature the ability to characterize structures based on their material makeup within a single scan. This will change and improve clinical pathways to personalized medicine." Schubert believes many aspects, including equipment, will continue to evolve, but none more so than applications and cloud computing. "When we consider the enormous amounts of data generated by a CT scan, there's a tremendous amount of data to capture and optimize," he says. "With the introduction of the GE Health Cloud, there is tremendous potential to turn volumes of data from a CT scan and enable greater insight and analytics for clinicians to further enable better outcomes. We are seeing incredible promise in managing massive data sets in areas such as processing speed of 3D visualization or bringing together patient case planning through multidisciplinary care teams with virtual viewing and planning." Ease of use, simplicity, automation, and functional imaging are all advancements Ziemba-Landon expects to see from the modality in the years ahead. Another area that will continue to grow is CT's role in chest pain management. Ziemba-Landon notes that hospitals often need to evaluate patients quickly in order to reduce time spent in the ED, while also ensuring a safe discharge. Industry insiders reveal that perhaps the biggest change will be driven by artificial intelligence/computer-aided design and expanded analytics. Health care is in a place where there is an influx of data, but its power has yet to be harnessed. CT technology will continue to see advancements that quantify and make sense of these data—using them to bring value back to the radiologist, provider, and patient.